As I drove into Northam for opening night of my first show at The Link Theatre, I remember clearly thinking what the hell am I doing? It had been over 20 years since I had stepped onto the stage and I certainly felt all those years at that moment. Even then, the only experience I had was in a high school production where admittedly many people thought I was in fact an actual teacher playing the role of teacher but still not an expansive career. Stepping off the stage on our final night, I knew that this would be a place I would be frequenting often. In fact, I was stepping straight into my second production the next week and I couldn’t have been happier about it. When I first contacted the Northam Theatre group, I was very apprehensive about getting involved, I remember being anxious about even turning up to the monthly get together. But I was always made to feel welcome by everyone right from that first day. From that moment, I started to feel excited about getting involved and stepping onto the stage. There is incredible value in getting involved in a community group especially in a rural area but with limited volunteers, many ventures into volunteering result in people feeling like it’s more work than joy. This is why I think it is vital to find something you are passionate about and this is what I found in the theatre. The two shows I performed in so far this year have been a wonderful start to community theatre. Proposals with its three One Act Plays in June was a great way to dip my toes in the water. Whilst a bigger role than I originally intended, there were fewer lines to learn and a shorter time on stage being a one act. 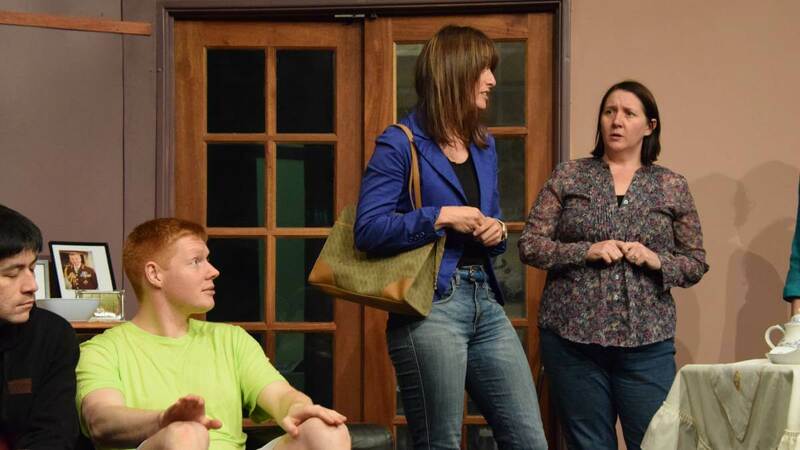 Alan Ayckbourn’s Family Circles in August certainly threw me into the deep end! With complex twisting plots, characters that changed for each scene and many more lines to learn, there were times when I wasn’t sure I was up to the challenge. I am incredibly grateful to my fellow cast and directors for sharing their wisdom and experience with me. In the end, both plays were a roaring success and I had an absolute blast. I work as a blogger on the side and regularly review live performances so being on the other side was a unique experience and something I am looking forward to doing again soon. Being on the stage is not all that is involved in the theatre, however. There are many talents behind the scenes that make the Northam Theatre Group tick. Of course there are directors and backstage assistants but there’s also the scenery, lighting and sound, without which these shows would be nowhere near as enjoyable. Even outside the theatre doors, there are all the hands that make the production run smoothly; from publicity, to the bar, right through to the ushers on the night. Putting on a production is no small feat and it takes many hands to get to opening night and have a successful run. The Northam Theatre Group is unique in that it owns the building that performances take place in and it is one of the oldest theatre groups in Australia. The previous committee and members worked tirelessly to fundraise and create this amazing venue that includes retractable seating, a spacious green room as dressing room. This year, the theatre is going through an amazing revitalisation which includes over $60,000 worth of new sound and lighting equipment. The funds for this project have been raised through fundraising and grants – both requiring very hard work from the members and committee. This space has also been used by other community groups as well such as the Perth Academy of Performing Arts (PAPA) who run weekly drama classes for kids and young adults, and for events such as Fringe Festival and the Northam Performing Arts Festival. At the heart of the Northam Theatre Group there is a committed group of people who are passionate about our community and the theatre Some members have been around for well over fifty years and are still actively involved. If you have any desire to appear on stage or behind the scenes, I can highly recommend popping in and visiting the Northam Theatre Group to see how you can get involved. And of course, if you have been one of our awesome audience members, to you we say thank you, without you we couldn’t keep doing what we do! You can find Northam Theatre on Facebook and Instagram as well as on their brand new website. Tagged Link Theatre, northam, Northam Theatre Group, theatre. Bookmark the permalink.